This was a cute book. It was an homage to Sabrina, the Audrey Hepburn classic with a modern- and gay- spin. Set in the Napa Valley wine country with Luca as an up and coming chef, his childhood best friend and crush James and James’ older brother Dylan. The brothers grew up affluent, sons of a winery owner- while Luca and his father the chauffeur lived over the garage. I really liked that this book was set in wine country. Having lived there for 10 years, I know how cut throat restaurant and wine business can be- especially when there are awards to be handed out. Tara Lain got that completely right. All of the characters were interesting in this story. From the three main characters to all of the parents and the secondary characters. Each held their own without distracting from the story- in fact they really enhanced it. Like I said, it was a cute story. There was a good balance between the drama of the restaurant side of the story and the sweetness of the romance side. Although I did want to really smack James upside the head more than once. If you are looking for something sweet to perhaps cleanse the palate, but still want a good story- this one is for you. Cover Artist: Reese Dante. Cover is cute and inviting. 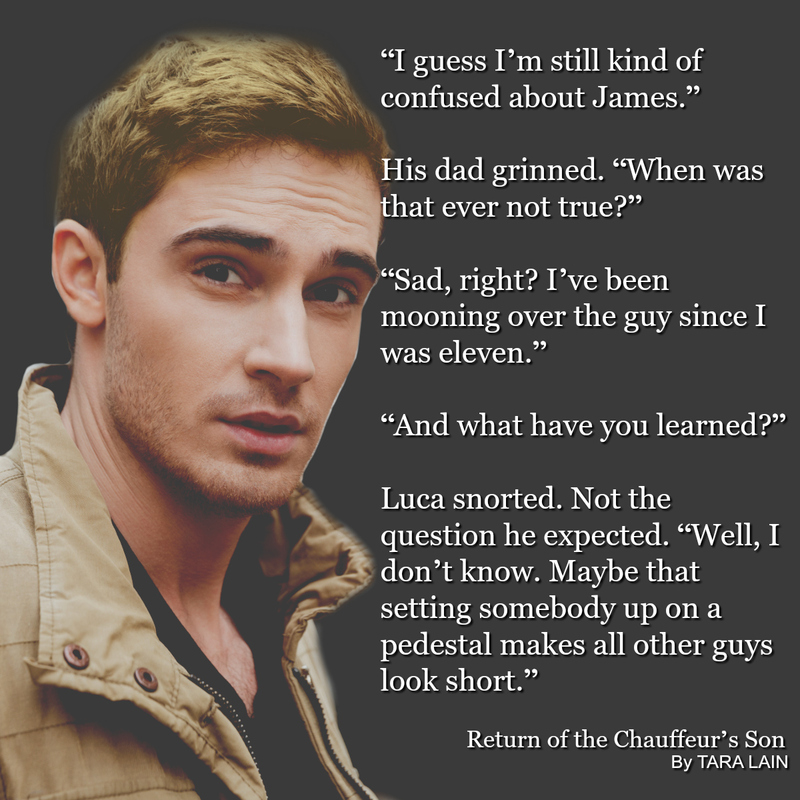 This entry was posted in Book Reviews, Books, Contemporary fiction, eBooks, LGBTQ Book Reviews, M/M Book Reviews, M/M Contemporary Fiction, M/M Fiction, M/M Romance, Uncategorized and tagged A Jeri Recommended Story, A Jeri Release Day Review, A Jeri Release Day Review: Return of the Chauffeur’s Son by Tara Lain, author Tara Lain, Return of the Chauffeur's Son by Tara Lain. Scattered Thoughts and Rogue Words is happy to have J.T. Hall here today talking about the influences in her latest story in her Oddities series, Fraud Twice Felt. Welcome, J.T. No, I’m not talking about the popular anime series, but the “real” yokai, or Japanese legends of spirits which often take on monstrous forms and torment mankind. I’ve always had a fascination with Japan and Japanese culture. I don’t know why, but I find their culture intriguing, from the grace and beauty of geisha, origami and bonsai trees to the crazy and often funny television shows and manga. My partner is Japanese-American, and we were fortunate enough to be able to visit Japan several years ago. I’ve been wanting to include more of this cultural influence into my writing ever since. When I started designing a gay paranormal romance series, I didn’t want the typical vampires and werewolves and other European monsters. I’d read up a lot about Shintoism and the concept in Japan that everything has a spirit. So I decided in my “demon-infested” world that the so-called demons would come from Asian mythology rather than European. And since this is set in the Pacific Northwest where there’s a large Japanese community, having yokai seemed appropriate. The term “yokai” is made up of kanji for “bewitching” and “apparition,” “spectre,” or” mystery,” so basically it means a bewitching ghost. The term was used during the Meiji period (1868-1912); previously the same types of creatures had a different name that relates more to the spirits within things. The whole concept behind the yokai is that they are the life energy that dwells within all things, and they take various forms, often to the detriment of humans. 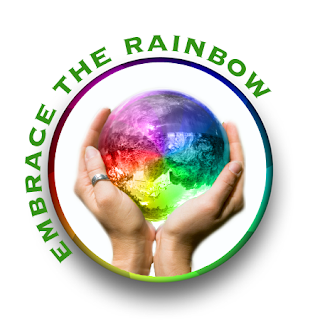 In the lore, various forms came from the stories of different religions including Shintoism, Taoism, and Buddhism. In fact, yokai don’t have to be of Japanese origin at all—any strange, supernatural entity (like Bigfoot, a will-o-the-wisp, etc.) is described in Japan as a yokai. The term includes any mysterious being. Because of all these different meanings and origins, and because there are really no rules about dealing with yokai, I felt they were perfect for the series. The yokai in the Oddities series are interchangeably referred to as either yokai or demons—the latter is more used by those of European descent or Judeo-Christian faiths. After all, there is no Hell in Japanese lore but outsiders might not know that. In the background of the world, German scientists opened up a portal between the natural world and the supernatural in their quest for the atomic bomb, and this allowed the yokai to begin manifesting on Earth wherever there is nature. (This ties in nicely with the Shinto beliefs that everything has a spirit). While there are religious figures shouting that this is the Apocalypse and that these are demons out of Hell, in this world the Japanese lore is actually the reality, so those views are misguided. I hope readers enjoy these spirits and monsters out of Japanese lore as they read Book 2 of the Oddities series, Fraud Twice Felt. It’s a tough place for two men in love to make a difference. 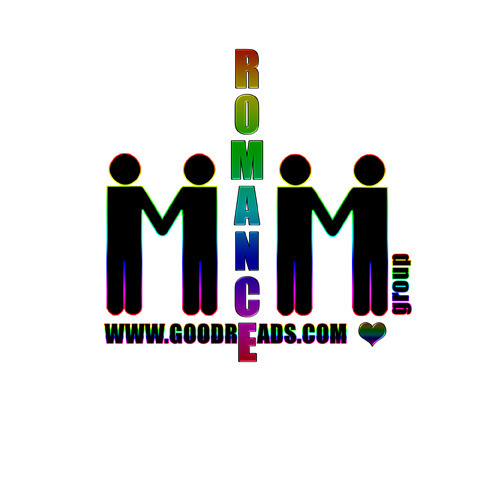 This entry was posted in Book Giveaways, Book Reviews, Books, eBooks, LGBTQ Book Reviews, M/M Book Reviews, M/M Fiction, M/M Paranormal Fiction, M/M Romance, Riptide Publishing, Uncategorized and tagged @JTHall7, @RiptideBooks, Asian mythology, Fraud Twice Felt (The Oddities #2) by J.T. Hall, gay paranormal romance, The Oddities series by J.T. Hall. Salvador, Brazil – While this same trip included Rio de Janiero, which is amazing and astounding, the place in Brazil that most impacted me was Salvador in the Bahia region. Sultry and warm, Salvador is the home of voodoo and it shimmers with a palpable mystery and spirituality. The food in Brazil is phenomenal in general, but in Salvador it just blew me away. Lots of chicken, seafood and rice, moqueca seafood stew is the regional dish. All of Brazil has much history of slavery since they were the last country to have slaves, and Salvador has the beautiful slave church. If you plan to make the trek to Brazil, don’t miss Salvador. New York – I’ve been to NYC a gazillion times and never get tired of the visit. I’m a huge fan of live theater, so on trips to the big city, my husband and I often get tickets to 5, 6 or more shoes. One trip, we tmed it right to get opeara tickets at the Met and saw Marriage of Figaro and Madame Butterfly in never-to-be-forgotten performances. 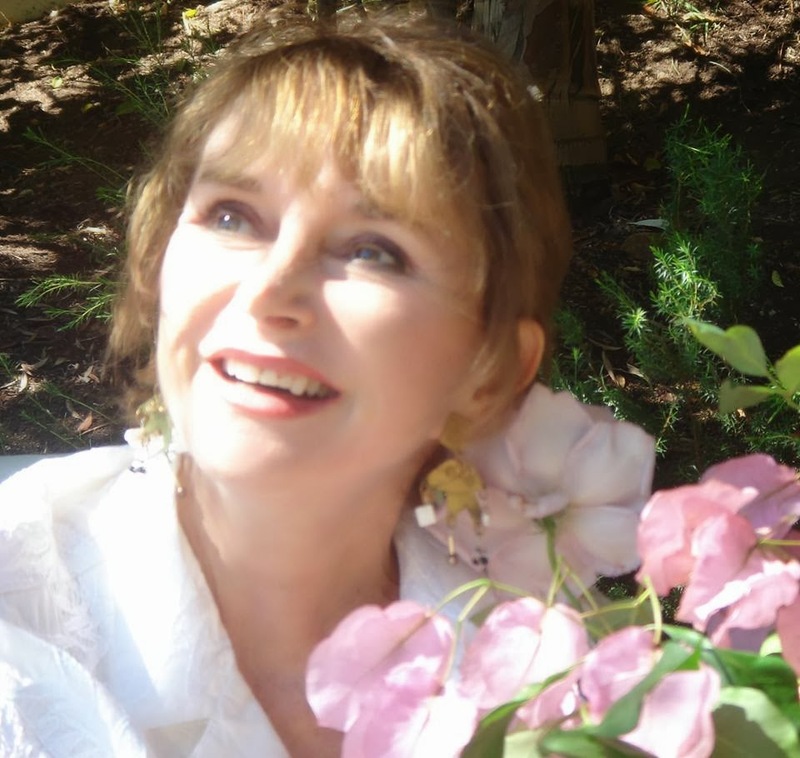 Paris – I’ve also had the privilege of visiting Paris more than once. I think it’s the most beautiful city in the world (even including Venice that gives it a run for its money) and is so lively and ever changing, it’s always a wonder. The food is at least as good as people say, such that even a simple omelet can be a culinary experience. There are concerts going on all the time in amazing, historic venues – like the time we saw a string quartet perform in Sainte-Chappelle. Ashland, Oregon – I know this seems very unexotic compared to the others, but Ashland has a justifiable famous Shakespeare Festival that captivates me. For my birthday this year, my honey and I are going back to Ashland to see a bunch of plays. The town is charming – very artsy and walkable like Laguna Beach – and it makes for a fun, relaxing vacation. Add to that, trips to Napa Valley where I love to hop from winery to winery for little tastes and then finally settle in with a good meal and a nice glass of champagne. 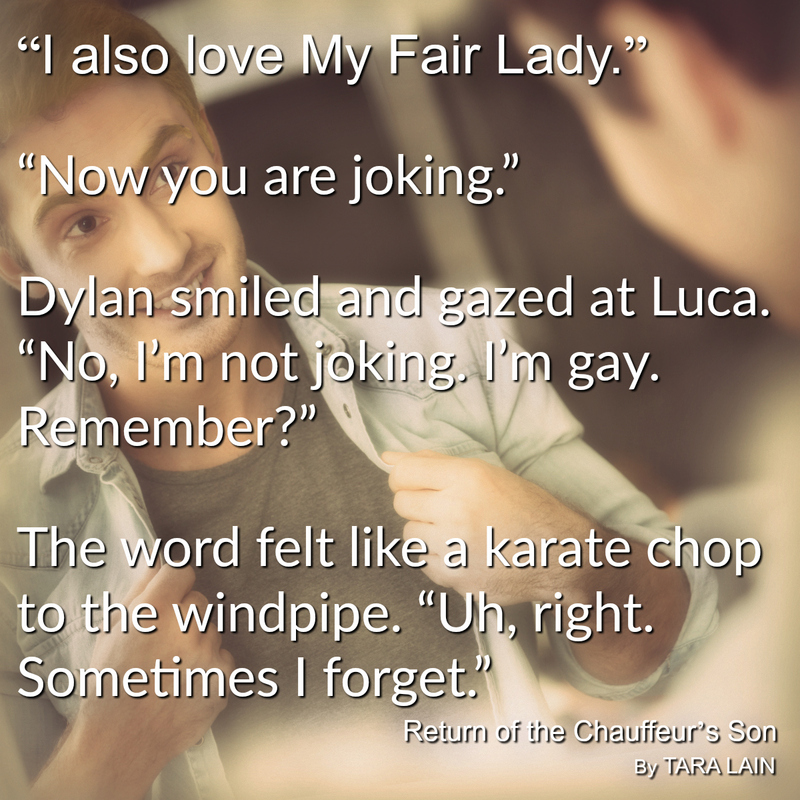 I call Return of the Chauffeur’s Son my champagne novel. It’s full of sparkle, tang and romance. I hope you enjoy it. 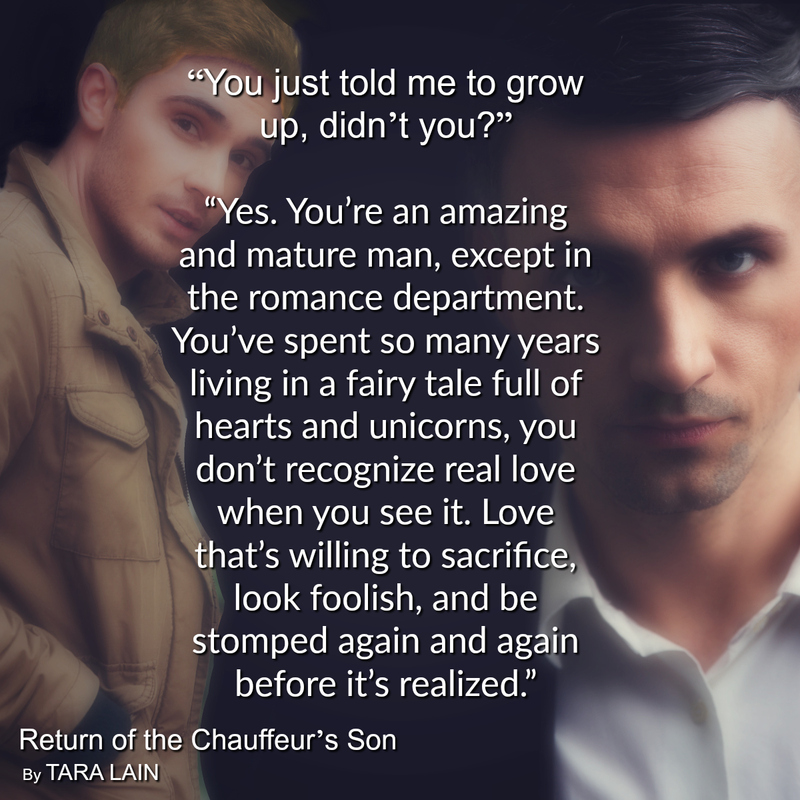 This entry was posted in Book Giveaways, Book Reviews, Book Tours and Contests, Books, Contemporary fiction, Dreamspinner Press, eBooks, LGBTQ Book Reviews, M/M Book Reviews, M/M Contemporary Fiction, M/M Fiction, Uncategorized and tagged #EnchantressDesignAndPromo, #newbookreleases, #ReturnoftheChauffeur's Son, @dreamspinners, @taralain, A Dreamspinner Press Author Guest Tour, author Tara Lain, Return of the Chauffeur's Son by Tara Lain, Tara’s Travels by Tara Lain.